Oil and gas majors like ExxonMobil Corporation (NYSE:XOM) and Royal Dutch Shell Plc (NYSE:RDS-B) have had a rough run since mid-2014. But these two industry giants are making the changes needed to deal with today's difficult energy markets, just like they've done time and time before. You could worry, but you really don't need to. Here are their bonafides. Exxon has gotten a lot of bad press recently. It's being investigated by several states over its disclosure practices when it comes to the impact of global warming on its business. And it just pulled 3.3 billion barrels of oil from its reserves, an unusual occurrence for this conservatively-run company. But business doesn't move in a straight line -- it's a sine curve. And since mid-2014, oil has been a tough business. Which is why you have to look at its background. For example, it has 34 consecutive years of dividend increases, as the oil giant has historically focused on returning value to shareholders in good and bad markets. Industry leading financial and performance metrics are further proof that it's a top player in the oil space. Notably, Exxon is at the head of the pack when it comes to return on invested capital, so it not only returns value to shareholders via dividends, it manages shareholder money prudently as well in getting solid returns. Well-run, and a long history of returning value to shareholders... that's a story that's hard to beat. And one that will let you sleep well at night, even during an industry downturn. I should know -- I own the stock. Royal Dutch Shell, meanwhile, might seem like an odd juxtaposition here. Like Exxon, Shell has struggled during the downturn; that's to be expected. But it did something that no other oil major has, making a major acquisition -- $50 billion to acquire BG Group -- that materially increased its debt burden right when low oil prices were pressuring its top- and bottom-lines. So Shell is in a more precarious financial position than Exxon and, indeed, many other oil companies. But this investment is meant to shift the company more heavily toward natural gas, an fuel that is expected to provide a bridge between carbon fuels and clean energy. Shell has now begun to sell other non-core assets to pay off its debt, with a goal of $30 billion in divestitures in coming years. Those sales, meanwhile, will further hone the company's natural gas focus. XOM Total Long Term Debt (Quarterly) data by YCharts. Here's the thing: Recent headlines might cause a little trepidation, but it's unlikely that Shell is going out of business anytime soon. In fact, even after a huge increase in debt, long-term debt only makes up around 30% of the capital structure (Exxon's long-term debt, for reference, sits at around 15% of its capital structure -- that's at the low end of the industry). 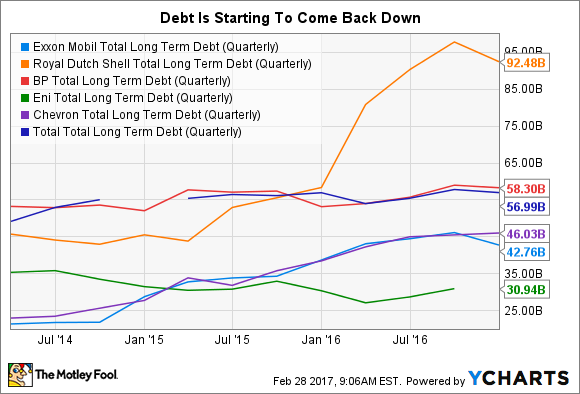 Shell also happens to have around $19 billion in cash offsetting some of the roughly $83 billion in long-term debt on its balance sheet. More important, the moves it's making, while bold, are strategically positioning it for the future. Summing it up, although it seems like risk has moved up in the near-term at Shell, this is a company that's looking into the future, and preparing now. If you take the long view, too, the risk increase may bt less than it seems. In fact, this is the type of thing you want to see the company doing, as the business environment changes. And as for the debt, the company has a plan to address it, and it's already paying off as noted above. 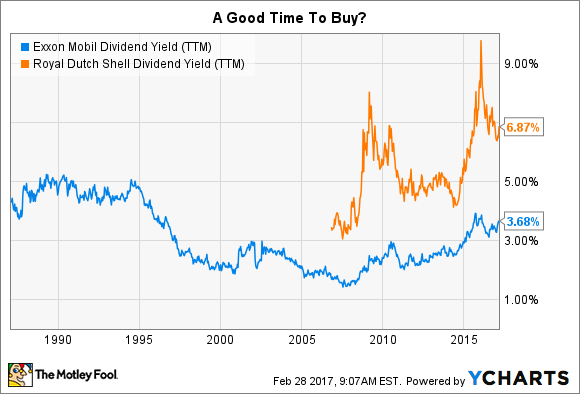 XOM Dividend Yield (TTM) data by YCharts. Both Exxon and Shell have proven they are long-term survivors. Although the headlines appear to highlight increased risks, a deeper dive shows that the troubles really aren't as big as they seem. This pair really are companies you can buy and hold without having to babysit. The most exciting thing, however, is that both trade with yields near the high end of their historic ranges today. So not only are they stocks you don't have to babysit, but now could be a good time to jump aboard if you are looking for income growth.